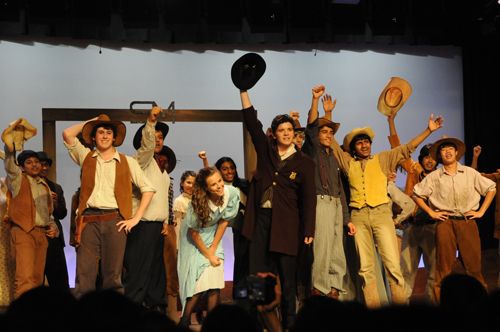 For this year’s spring musical, the Harker Conservatory returned to a familiar favorite, Rodgers and Hammerstein’s “Oklahoma!” directed by Laura Lang-Ree. Set in pre-statehood Oklahoma in the summer of 1906, the production centers around the love triangle between Laurey Williams (Cecilia Lang-Ree, grade 12), niece of the respected community figure Aunt Eller (Cristina Jerney, grade 12), lovesick cowboy Curly McLain (Ian Richardson, grade 11) and the mysterious and dark farmhand Jud Fry (Justin Gerard, grade 12). Meanwhile, the flirtatious Ado Annie Carnes, played by junior Shenel Ekici, reaches a crisis of conscience when she realizes her attraction to the Persian merchant Ali Hakim (Rohan Chandra, grade 12), despite her engagement to the good-hearted but fiscally irresponsible Will Parker (Kevin Moss, grade 11). Drama and comedy naturally ensue, as conflict grows between Curly and Jud over who will win Laurey’s favor, and Ali Hakim tries to undo the situation involving himself and Ado Annie. The huge upper school cast included several grade 5 students, all of whom gave splendid performances. Musical director Catherine Snider led the “Oklahoma!” band, whose interpretation of the beloved score was both accurate and inspired, providing the perfect backing for the student singers. In order to ensure the best performance possible by the students, Lang-Ree enlisted the services of dialect coach Kimily Conkle, who instructed the cast in how to effectively convey the time and place of the musical with the right pronunciations and inflections. Fight choreographer Dexter Fidler was also brought in to direct the fight scenes, most notably during the iconic 15-minute dream ballet that closes Act I. Crucial to all Harker musical productions is the set design, and longtime designer Paul Vallerga came through with a set that remarkably evoked the plains of the early 1900s. Harker students, as always, did a terrific job as the show’s crew, managing the stage, working the light board, assisting with wardrobe and attending to all the other important tasks required to execute a production of this caliber. Meanwhile, sound engineer Brian Larsen, lighting designer Natti Pierce-Thomson and costume designer Caela Fujii were again indispensable.